The Fruit Contest will appeal to children and adults who are interested in learning more about the nutritional qualities of fruits, their origins and peculiarities. 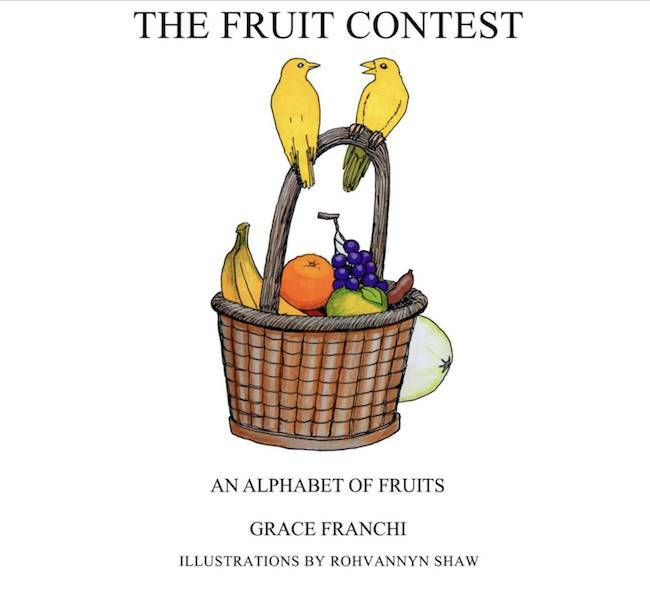 The Fruit Contest: An Alphabet Of Fruits, authored by Grace Franchi, is the story of various fruits, each one competing to be the best among them all. One sunny spring morning, little Renee overhears a conversation as she does her homework at the kitchen table. The talk is about which among the assorted fruits in the basket is the most important, tastiest, and most beautiful. Two canaries begin the discussion, and before long, a competition arises among the fruits for they all want to be the finest. Each fruit speaks for itself in alphabetical order as they relate their wonderful characteristics and origin. After every fruit in the basket-from apple to zucchini-has given its speech, Renee finally intervenes, saying that each of them is a winner for they are all regarded as treasures given by Nature. The paperback and Kindle versions of this book for children can be found at CreateSpace and on Amazon and book stores. Are we fully aware of the important role that plants play in our lives? How much do we know about them? With over three hundred thousand species, ranging from the tiny green mosses to the giant trees, such as the sequoia that may weigh as much as two thousand five hundred tons, the plant kingdom is the second largest kingdom. We are members of the rose family, and come in all shades of reds, greens and yellows. There are more than seven thousand varieties of apples grown around the world, although our tree originated in the mountains of Central Asia. Colonists brought apples to North America around the year 1600, and the first apple orchard in our country was set near Boston in 1625. The apple is the official state fruit of Washington, New York, Rhode Island, and West Virginia. We have been around for such a long time that nobody knows for sure our origins, but it’s possible that we may be native to western Pacific. Early Spanish explorers gave us the name coco, which means "monkey face" because the three indentations (eyes) on the hairy nut resembles the head and face of a monkey, and Nucifera, from Latin, means nut-bearing. Are you surprised to see me in this contest? Although people refer to eggplants as vegetables, botanically speaking we are fruits because we have seeds. Even more, within the fruits, botanists classify us as berries. We are close relatives to tomatoes, potatoes and peppers. Indigenous to South and Eastern Asia, we have been cultivated since prehistory. We come in several varieties that differ in shape, size and color. We can be oval, cylindrical, round, long, large or small, and our skin varies in colors such as purple, lavender, green, brown, yellow, white and even orange. The largest ones, that grow in the region between the Ganges and Yamuna rivers, may weight up to two pounds.